Chairman of the Board, President, core founder of Luye Life Sciences Group. Since 1994, Chairman Liu have led Luye Life Sciences Group to keep making progress and adhered to the road of independent innovation and globalization. Today Luye Life Sciences Group has developed into an international healthcare enterprise with three core businesses, Luye Pharma, Luye Medical, investment and development of new life science technology. Based on R&D and manufacture of innovative drugs, led by high-end medical services, and driven by cutting-edge life science research, Luye Life Sciences Group will devote to becoming a respected global leader in the life science industry. 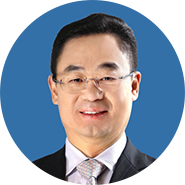 In recent years, Chairman Liu has received numerous awards and honors including “China Pharma – 60 Years /60 Stars”, “Top Ten Leaders in China’s Pharmaceutical Industry”, “China’s Pioneers in Independent Innovation”, and “Chinese Pharmaceutical Leaders of the Year”, and “Ernest &Young Entrepreneur of the Year”.